This. 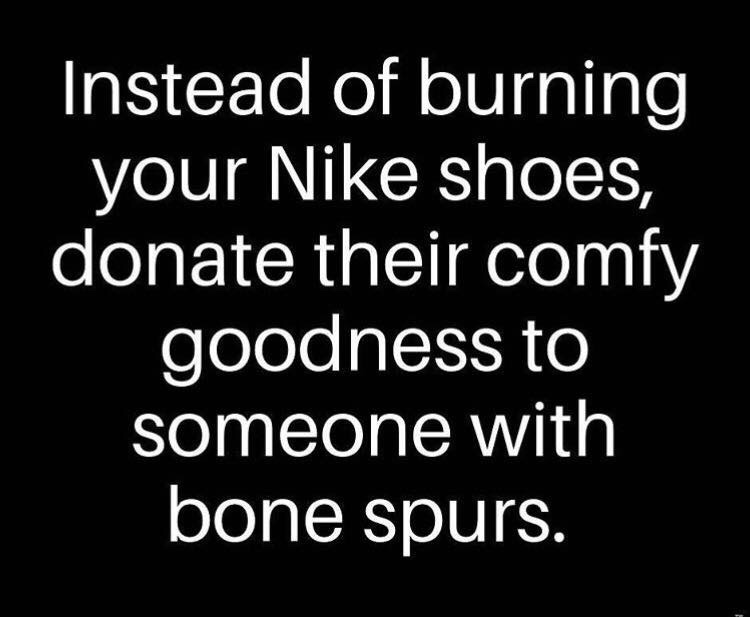 People need to be careful not to assign any sort of benevolent motive to Nike here. Their motive is profit, pure and simple. They have gotten much more publicity than if they had done an ad with Lebron James or Tom Brady. Brilliant marketing move. They nailed it here. I have to remember I’m not the target demographic. I buy new balance anyway. Athletic shoes New Balance, Golf shoes Foot Joy. No other brands considered. Just in case you have shared the Pat Tillman Nike meme, you should know that his wife doesn’t want you doing that. How it all started, and how we got here. (Unfortunately, the people that could learn something by reading this likely won't bother). Aug 14, 2016- Colin Kaepernick sits for the national anthem.....and no one noticed. Aug 26th, 2016- Colin sits and this time he is met with a level of vitriol unseen against an athlete. Even the future President of the United States took shots at him while on the campaign trail. Colin went on to explain his protest had NOTHING to with the military, but he felt it hard to stand for a flag that didn't treat people of color fairly. Then on on Aug 30th, 2016 Nate Boyer, a former Army Green Beret turned NFL long snapper, penned an open letter to Colin in the Army Times. In it he expressed how Colin's sitting affected him. Mr. Boyer goes on to write "There are already plenty people fighting fire with fire, and it’s just not helping anyone or anything. So I’m just going to keep listening, with an open mind. I look forward to the day you're inspired to once again stand during our national anthem. I'll be standing right there next to you." Empathy and understanding was shown by Mr. Boyer.........and Mr. Kaepernick reciprocated. But why kneel? "We sorta came to a middle ground where he would take a knee alongside his teammates," Boyer says. "Soldiers take a knee in front of a fallen brother's grave, you know, to show respect. When we're on a patrol, you know, and we go into a security halt, we take a knee, and we pull security." Empathy, not zealotry under the guise of patriotism, is the only way meaningful discussion can be had. Mr. Kaepernick listened to all of you that say he disrespects the military and extended an olive branch to find a peace. When will America listen to him? We can all learn from this backstory. The truth often lies in the middle. Seek to learn the opposing side's point. 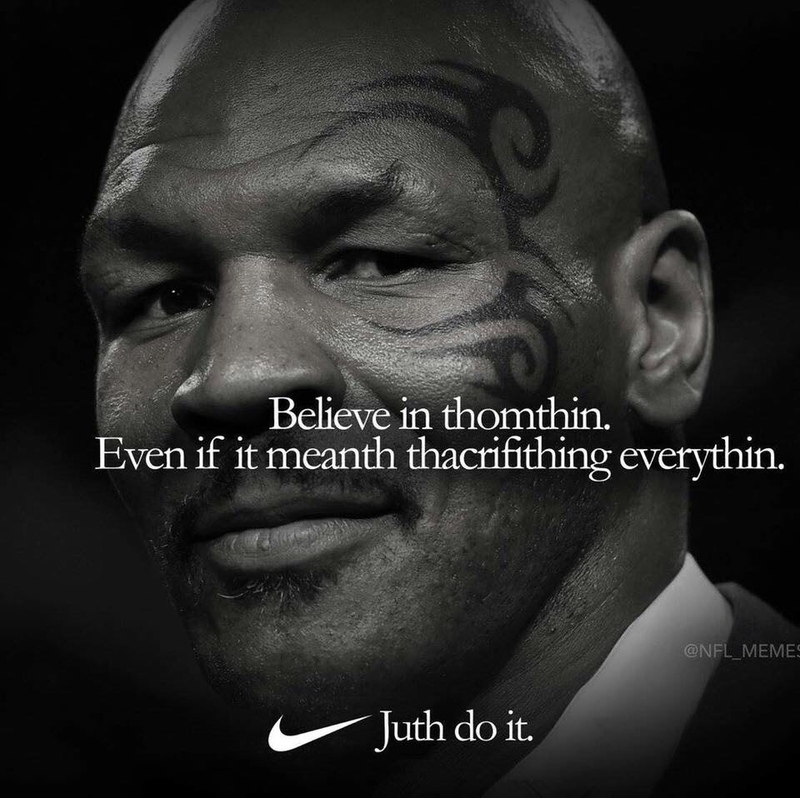 Nike's marketing team is on fire (sorrynotsorry). So you're taking your experiences with people in small town Alabama and projecting them on to people across the country who you've never met simply because their skin color is the same as those in your experiences in small town Alabama? You don't get to tell people how to receive the message you send. Honestly, there were about 150 million Americans treating other Americans of different race appropriately way before he started his protests. As far as I'm concerned the American flag represents far more amazing people than trash, and not standing for the Anthem is judging many over the actions of a few. Sounds like stereotyping to me.